Beautifully printed, enough for two aircraft, and adds that little something to a detailed model where many older kits may lack these decals. None noted, although steady hands and a good lens will be helpful! Highly recommended to those of you who go the extra yards as they will add that little extra accuracy to your model. 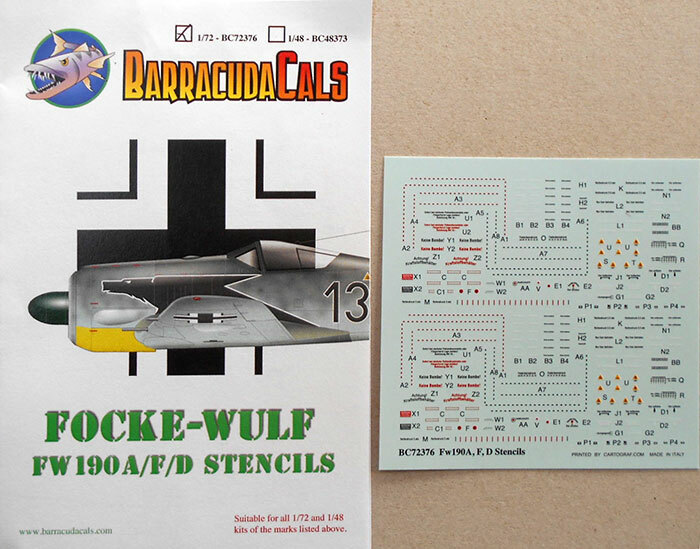 As with the Spitfire sheet yesterday, but this is slightly larger at 80x80mm and covers stencils for the Focke-Wulf FW190 variants, the A, F and D.
Again, two full airframes are catered for, finely printed and readable by those with better eye-sight than mine! Recommended for any FW190 modeller in either scale.